Dave Hughesy Hughes shows off his teeth x-ray on Hughesy, We Have a Problem. COMEDIAN Dave Hughes has blamed orange juice and a lack of oral hygiene for the incredible number of teeth he has lost. On Tuesday night's episode of Hughesy, We Have a Problem, Hughesy confirmed he had lost almost a third of his teeth, with 10 of the 32 already gone. "One of my problems right now is that I am missing a number of teeth," he stated. "Not just one, two, three ... I'm missing 10 teeth." Hughesy told guest panellists Meshel Laurie, Sarah Harris, Luke McGregor and Merrick Watts that he didn't brush his teeth "for a few years" during the late 80s when he "didn't have a girlfriend" and because he drank "a lot of orange juice as a child" the teeth quickly fell out. He has discussed the issue before on his radio show, Hughesy and Kate, but turned to the Australian public last night and asked "should Hughesy get his teeth fixed"? He joked his wife now thinks he looks like a drug addict. 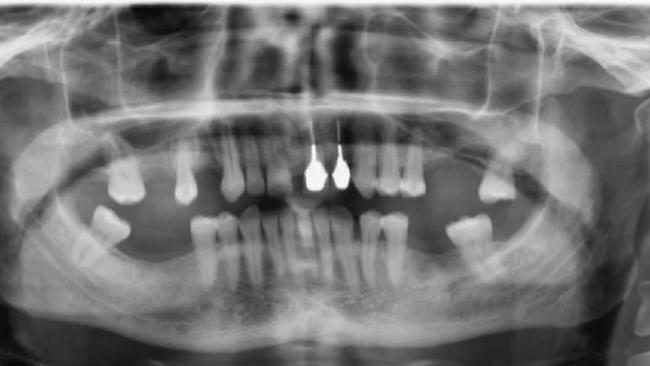 He said she forced me him to go to a specialist to get them fixed and after an Xray was told he "doesn't have enough jaw to fit in the bolts to put in the false teeth". But he was given the option of doing a "bone graft" which is a procedure Hughesy delicately explained: "Take some hip bone, put that in your mouth and then you wait six months to see whether that nips with your jawbone and if it does, you'll have enough room for the bolts so we can start drilling. "I said, I'll have a think about it, have you got a brochure?" He said he feels like he has more "defined jaw line" because of his missing teeth. He joked he chooses "soft food" on Today Extra after the show and said, "there's a lot going on back there". While the guest panel seemed split on the idea of fixing Hughesy's teeth, after strong audience support he choose to keep his mouth just the way it is.